Home / News / Furniture Art Spotlight – Millennium Falcon™ Asteroid Coffee Table! 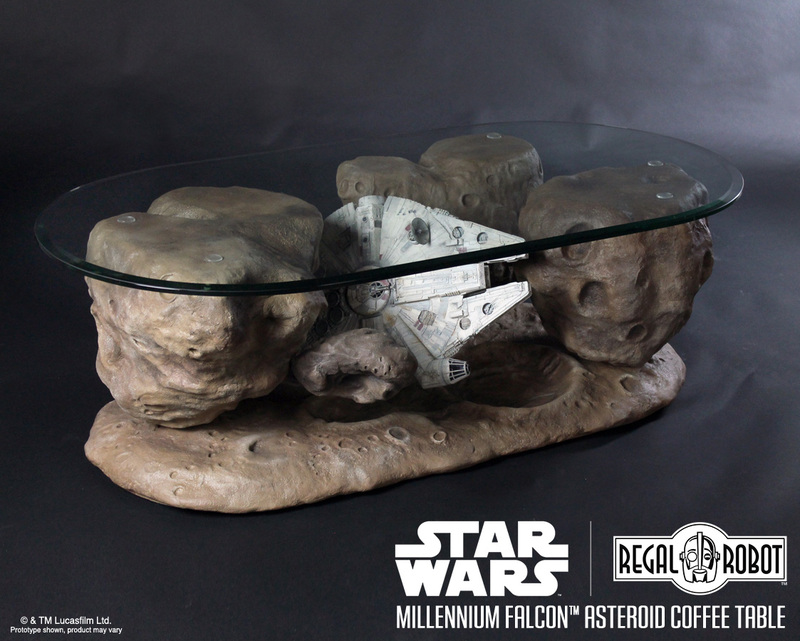 Furniture Art Spotlight – Millennium Falcon™ Asteroid Coffee Table! Furniture Art Spotlight – Capturing a Moment with our Millennium Falcon™ Asteroid Coffee Table! 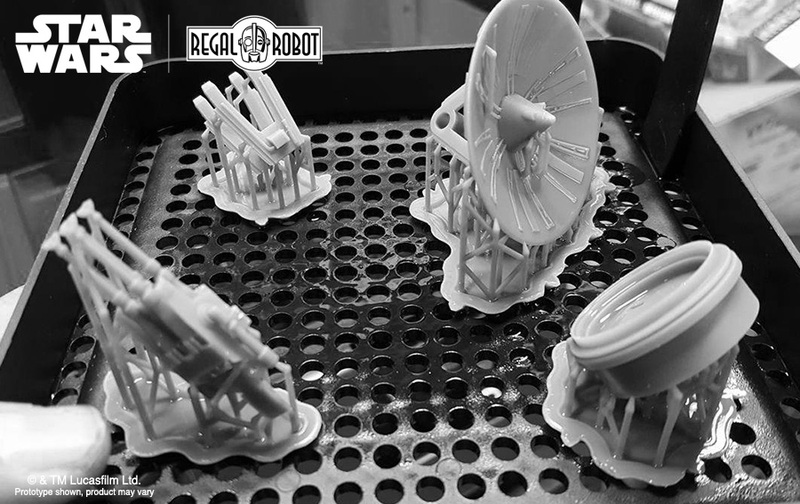 Here are Regal Robot, we believe that themed furniture can not only bring Star Wars™ into your home or office, we believe it can capture a moment from your favorite scenes in that classic trilogy and become furniture art! Our Millennium Falcon Asteroid Coffee Table does just that. 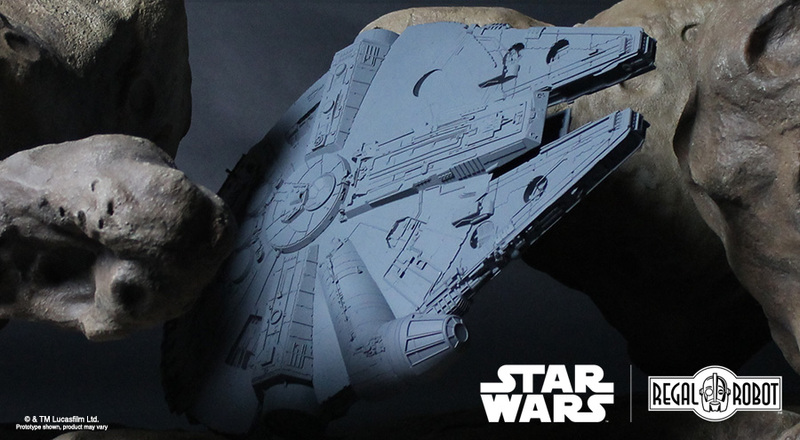 Part sculpture, part furniture, it grabs a frame of film from the asteroid chase scene in Star Wars: Episode V the Empire Strikes Back and brings it to life in an incredible, hand crafted functional diorama that’s made by our artists in the USA. The hand sculpted asteroid base for our coffee table has a nearly lunar look to it! Creating the prototype for this highly custom and very unique coffee table began with hand sculpted asteroids from rigid foam and clay. 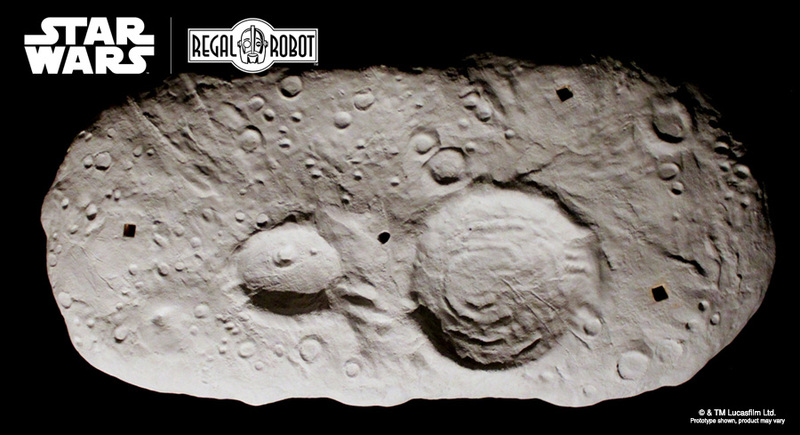 Richard sculpted these with similar textures and style seen in production photos provided by Lucasfilm of the original movie asteroid props and models. Richard also hand painted our asteroid prototypes, which is exactly how we paint every part of the production models of this coffee table. Richard Riley painting our first prototype of the asteroids from this coffee table. The asteroids were molded in large silicone and fiberglass negative molds to allow us to reproduce them in resin as we create each customer’s coffee table. While Richard was creating our asteroids, Gordon Tarpley began work on a 3D model of the Millennium Falcon which was provided to us by Lucasfilm. 3D printed blaster and radar dish assembly, waiting for final cleanup and prep. The 3D model was originally created for video work, and hundreds of hours of work went into preparing the file to create a real-world model suitable for molding. It was output on a high resolution 3D printer in a number of pieces and Steven Richter spent numerous additional hours refining those parts and then molding them for reproduction in resin, creating the final models for our production pieces. Fully primed, our Millennium Falcon™ model is ready for paint! Great care went into every step creating this highly themed coffee table, and the painting of the Millennium Falcon is no exception! We paint each model by hand, adding the layers of weathering and authentic detailing you’d expect from the “used universe” style of the Star Wars films. Each 54″ long table is hand assembled and hand painted in our studio by artists and craftspeople who love these films as much as the fans who are our clients! Want to learn more about this official Star Wars creation? Visit our Millennium Falcon Asteroid Coffee Table page for many more photos and full details about this amazing piece of furniture art, or to order yours today! At Star Wars Celebration Orlando this year, Jordan Hembrough stopped by to talk with Tom about our Millennium Falcon Asteroid Coffee Table for the Star Wars Show!